You can choose to have your blind made to fit the inside of the recess of your window or it can hang on the outside. Exact: This is the measurement you need to take if you want your blind to hang outside the window recess. We will make your blind exactly to these measurements. 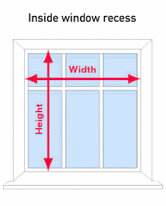 Recess: This is the measurement you need to take if you want your blind to fit inside the window recess. We will make your blind to fit into the recess perfectly. There's no need for you to make any adjustments. 1. Measure the width of the recess from wall to wall in three places as shown. Note down the shortest measurement - this is the one we'll use. 2. Measure the drop by taking the measurement from the top of the recess to the window sill in three places as shown. Note down the shortest measurement. 1. Measure the exact width of where you'd like your blind to be. Note down the measurement. 2. Measure the exact drop from the top of where you want your blind to be to the bottom. Note down the measurement. Important note for measuring Roller blinds! For Roller blinds, we have to allow for fittings at either end of the blind, as there is no head-rail. This means the actual fabric is approximately 2.8cm less for an exact measurement and 3.3cm less for a recess measurement. You don't need to make this adjustment, we do. You can measure you blind in either inches or centimeters, the online order form accepts both measurements. Always look out for things like window handles or tiles. You'll need to take their position into account to ensure a perfect fit. If you have any questions about measuring your window, call 0844 8004 385 or email enquiries@blindsforhome.co.uk. 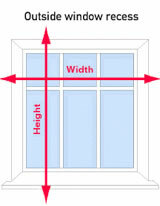 Notes: Always measure every window as no two windows are the same size. Blinds are custom made to fit each window. Please re check your measurements before ordering your blinds, any help required measuring for bay windows, conservatories or just general information please call our customer services on 0844 8004 385 Monday to Friday 9.00am till 5.00pm.